Why use Spray Polyurethane Foam Insulation? Foam insulation is spray applied directly into stud cavities or other surfaces, sealing joints and cracks throughout the structure's outer framework. Spray polyurethane foam insulation expands and fills unwanted voids in the building envelope to stop air infiltration. Spray polyurethane foam insulation quickly cures to a rigid monolithic insulation that holds tight and helps make the structure stronger. Spray polyurethane foam's performance enhances the mechanical ventilation equipment's ability to provide a controlled, properly ventilated environment. A spray polyurethane foam system also seals and reduces the temperature differences between the outside and inside wall - preventing convection currents of air from looping up and down in the walls. Homes and commercial buildings are designed to be tighter with more insulation value than ever before. Moisture from cooking, laundry, showers and industrial applications can be trapped, causing premature deterioration of the structure. Spray polyurethane foam insulation systems minimize both heat buildup and condensation, resulting in cooler and dryer attics in all climates. "R" refers to resistance to heat flow. These measurements are taken in a laboratory environment. But heat flow resistance is only part of the formula for effective insulation. R-value doesn't measure the amount of air infiltration or moisture that penetrates through an insulated wall. In short, the measurement doesn't factor in real-world weather conditions. The only way to eliminate air infiltration and moisture is to completely seal the building and use mechanical air controls to regulate air flow. Allows you to fit more insulation into less space (2" x 4"s instead of 2" x 6"s) - saving you money in lumber costs. Foam insulation performs in hot as well as cold temperatures, which is why your home refrigerator, freezer and hot water heater use foam insulation. Spray foam insulation minimizes airflow. Spray foam insulation helps eliminate drafts and provides for comfortable, even heat. Spray foam insulation provides improved humidity control. The foam inhibits moisture driver elements due to its closed cell structure. Insulates hard to reach areas. Provides quick, easy application by professionals. Provides a seamless layer of insulation. 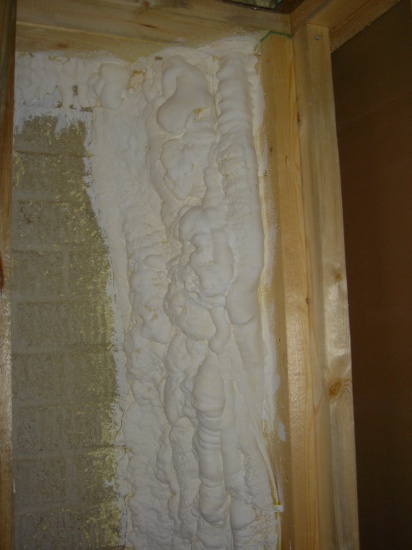 Foam's closed cell structure stops air leakage and inhibits air infiltration. Delivers a high degree of strength-to-weight ratio. Adds little weight to ceiling or roof areas. Reduces transportation costs compared to bulkier insulation products. 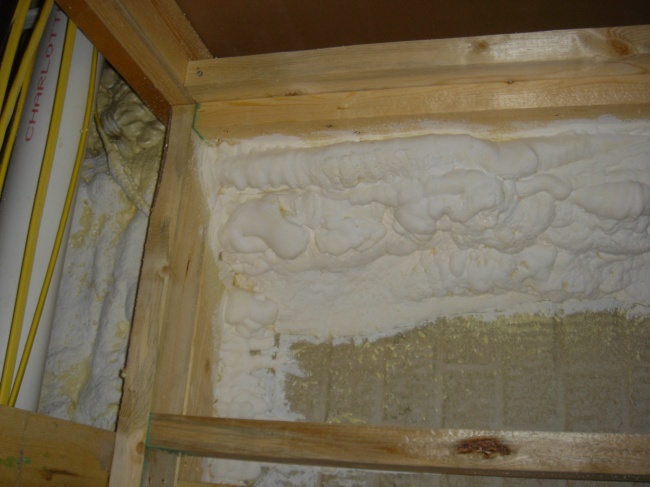 Foam insulation adheres to the surface that it is sprayed on and does not need fasteners to hold it in place. Materials meet building code requirements and are accepted nationwide. Spray applied polyurethane foam insulation must be covered with a 15 minute rated thermal barrier on the habitable side of the building such as ½" rated sheetrock.